It had been about three weeks since we had been to our own local flying beach. The weeks we had missed were either rainy or windless so we didn’t miss much. That is to say we didn’t miss much flying. We did miss the time spent with kite friends. So it was with some anticipation that we went to the weekly club fly on Sunday morning. What we found were a couple of fliers, a couple of thousand mosquitos and no wind. I’m beginning to feel cursed. We never left the parking lot. It just wasn’t worth it. So instead of flying, we hung out at the kite shop. 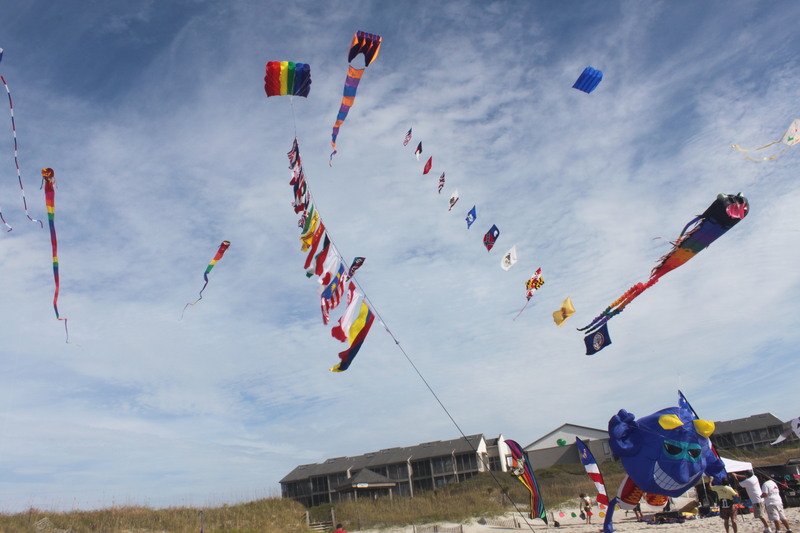 We’re helping get things ready for the Carolina Kite Festival. 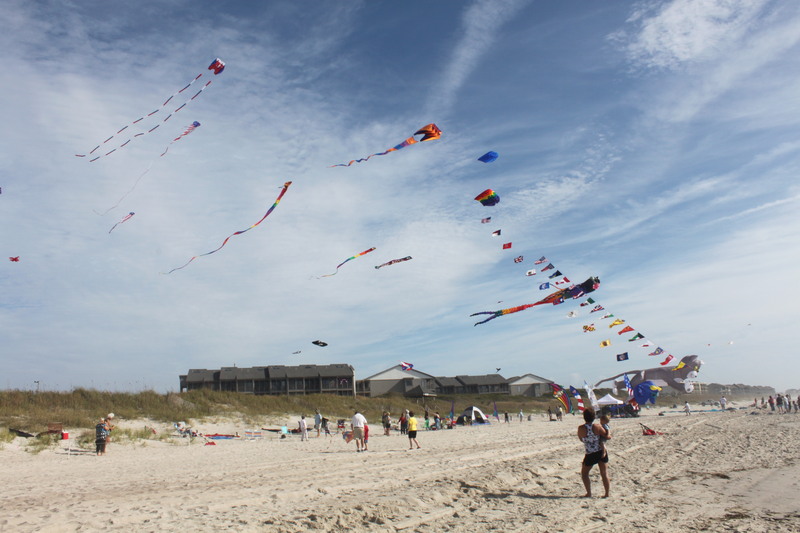 It’s the local festival sponsored by Kites Unlimited, Atlantic Beach, NC – our local kite shop. It was to be held at the Sheraton Atlantic Beach Resort on the beach. However, there has been a drastic change of plans. The Sheraton suffered major damage due to Hurricane Irene and has had to close their doors and cancel all events until January, 2012. Major headache. After a lot of phone calling, the festival has been relocated to the Atlantic Beach Public Beach Access, locally known as “The Circle”. I’ve been trying to help with Internet changes and making new brochures and stickers for old brochures. I’m not a computer guru but I can try to take some little things off the over-full plates of the kite shop staff. It’s been interesting to say the least. The hardest part will be getting the word out about the change. We finally got to fly for about an hour each on the following Tuesday and Thursday evenings. The first evening I flew the Dunston-Taylor box delta for the first time on our home field. It flew like a champ. 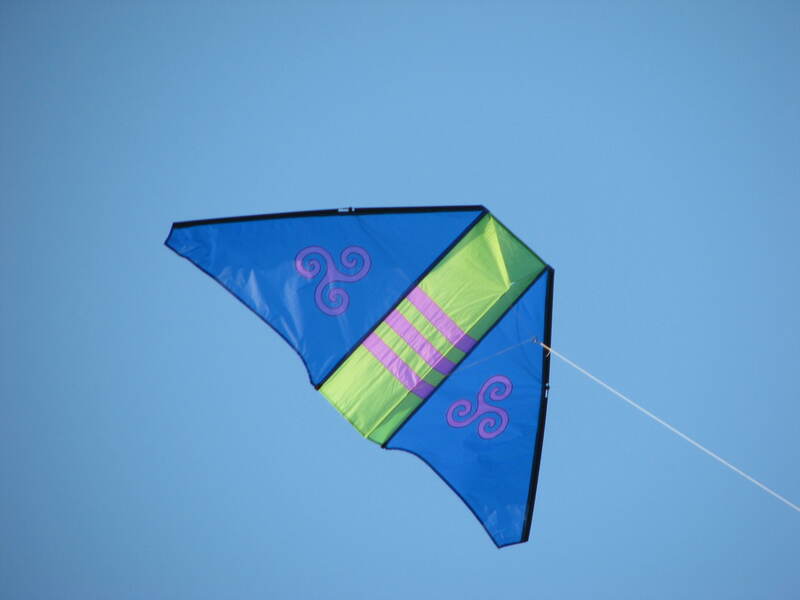 That kite is such a great flier I’m planning on making another with a much more outstanding sail pattern. Not sure what it will be yet but I’m sure I’ll think of something. John put up his early anniversary present, a Captain America Rokkaku by Ray Wong. It is a beautiful handmade kite that he has been admiring for some time. The wind was light but it just hung in the sky. While the two single-line kites were up, I flew my latest dual-line acquisition, a Nebula by Ron Phipps. 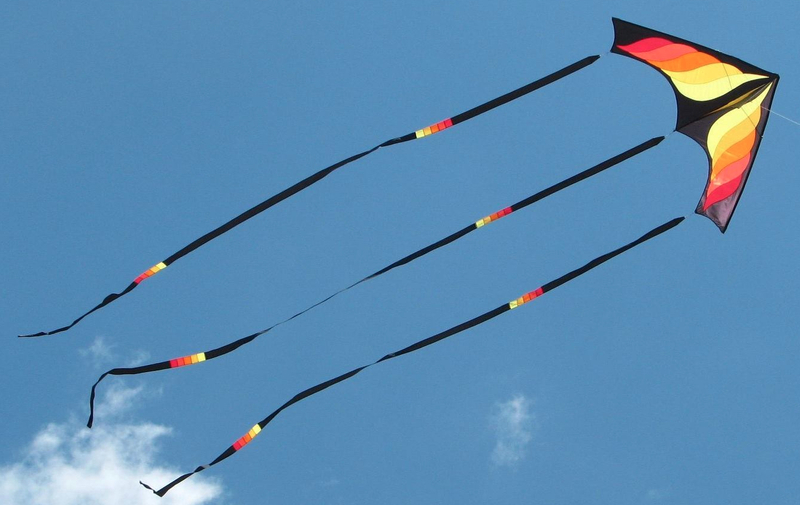 It’s a wonderful precision kite that is smooth and easy. I love the way it handles. I may actually learn to make push turns with it. Something I haven’t been able to do well with any of my other dual-line stunt kites. The second evening I practised with the Vamp Devil on short fifty foot lines. I was having fun with a rising wind when a family walked by with a little girl maybe three years old. She loved the Devil so I put on a show just for her. Lots of low-level flying that she could see easily. She laughed and giggled and gave the kite commands which I tried to follow. In fact, she was having so much fun she didn’t want to leave. And adult stayed behind with her while the rest of the family continued their walk. I didn’t get much routine practising done but I sure had a good time. We missed the weekly club fly again. But we did have a legitimate reason. Glad to see you’re back on the kiting path! Also glad to see you resuming your blog! The DT looks great! Also, a huge congrats to you on your competition wins! OUTSTANDING!! 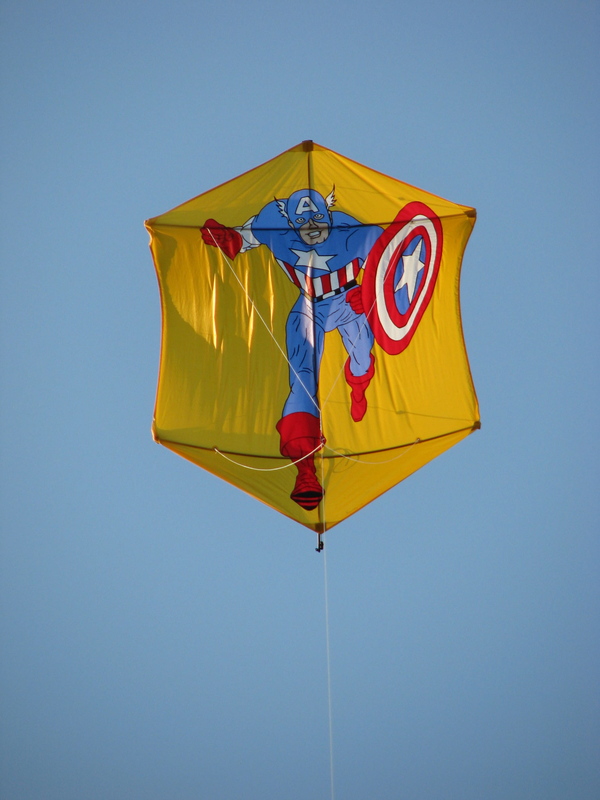 like the Captain America kite!